Exports of US sweet potatoes to Europe grew by 35 per cent during 2015 and reached a record $92 million (£64m), new figures have shown. According to the American Sweet Potato Marketing Institute (ASPMI), global exports also reached an all-time high with a sales total of $138m (£92m). 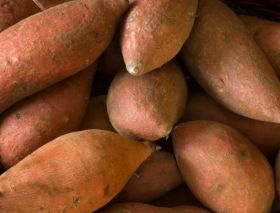 Following a promotional campaign designed to raise awareness of sweet potatoes, ASPMI ran a feedback survey of 1,000 consumers and found that purchase frequency per week increased by 183 per cent. In addition, the number of respondents who specifically buy US sweet potatoes jumped by 150 per cent. As part of the campaign, the organisation ran a media tour, and held tastings and product demonstrations at consumer events throughout Europe. The survey measured changes in awareness and purchasing patterns from a benchmark established the previous year. Europe is a growing market for US sweet potatoes, ASPMI said, with small family-owned producers seeing “considerable” increase in demand for exports. ASPMI was formed in 2013 to promote US sweet potatoes abroad, using funding from the USDA Foreign Agricultural Service (FAS) programmes.